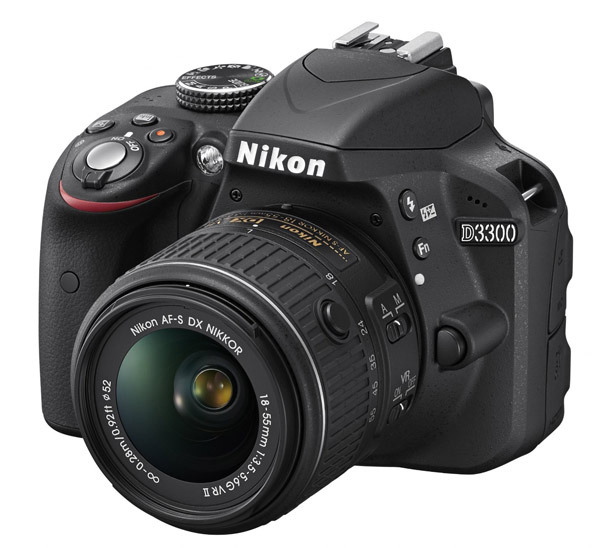 The entry level Nikon D3300 SLR is Nikon’s best selling DSLR. The D3300 is designed for anyone who wants to take pictures without worrying about settings, but with advanced features. It replaces the popular Nikon 3200. New for this DSLR is a new lens that retracts to a more compact size for easy transport, the video mode with full-time autofocus and stereo sound can now do up to 60 frames/second, and improved ISO to 12800, and new EXPEED 4 processor. With the built-in LiveView you can frame your movies and pictures with the large 3-inch LCD screen (921,000 pixels). Good solid performance from one of Nikon’s least expensive and compact DSLRs. Improved 5.0 fps continuous shooting, Ultrasonic Dust Removal System removes dust from the sensor automatically. The Active D-Lighting function vastly improves shadows and highlights of high-contrast scenes. Includes the new compact 18-55mm f/3.5-5.6G VR II lens (with image stabilization). New easy mode, for begginer photographers. Additional Features: Compatible with all NIKKOR AF-S and AF-I lenses that have an autofocus motor. In-camera photo editing: After shooting, the D3300’s photo editing functions allow for in-camera retouching. The upgraded Nikon EXPEED 4 Image Processor provides fast, accurate image processing and startup time, and 11 point autofocus system. H.264/MPEG-4 Advanced Video Coding. Improved ISO to 12800, Built in Flash. Wi-Fi Connectivity (Using the optional WU-1a wireless mobile adapter you can send images to your smartphone). Shutter speeds: 30 – 1/4000 second, ISO: from 100-12,800, Burst Mode: 5.0 fps, Built-in Flash. Memory Cards: SD, SDHC, and SDXC cards. Lithium-ion battery EN-EL14 (included). USB 2.0. Dimensions: 4.9″ x 3.9″ x 3.0″ ( 16 ounces). 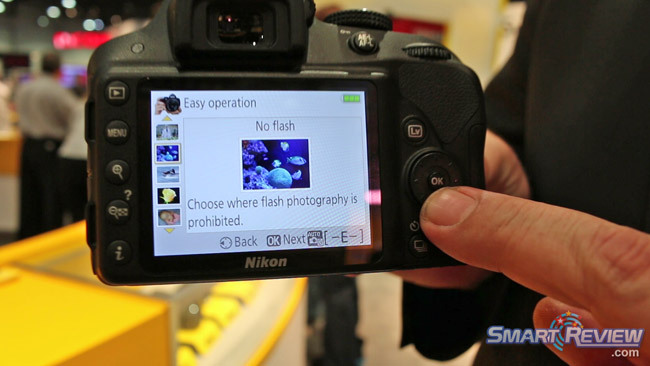 Smart-Review Commentary: Nikon’s entry level D3300 is one of Nikon’s best selling SLRs. Although low priced, it is loaded with advanced features. It is designed for simplicity of use. It has received excellent consumer and professional reviews for its price range. It has huge improvements from its predecessor, the D3200. Upgraded features include: New lens retracts for easy transport, new EXPEED 4 image processor for faster operation, Full HD recording with full-time autofocus up to 60fps, ISO upgraded to 12,800, manual exposure control and stereo sound. Full time autofocus will allow you to take video without having to manually focus as the subject moves, if you choose not to. An external microphone jack to this camera for better sound options. We believe this to be an excellent entry level SLR with features only seen in high end SLRs. This model has received excellent consumer and professional reviews. For its price, performance and substantial upgrades from the previous model, the Nikon D3300 is a Smart Review Top Pick for 2016.